The ‘Real Bodies’ exhibition closed early on September 16, 2018, at Sydney’s Entertainment Quarter Moore Park. The exhibit caused a public outcry over ongoing ethical concerns that the remains may be those of unwilling Chinese citizens. 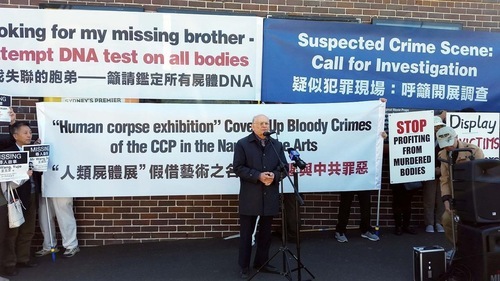 On the last day of the exhibition, the group Australians Against Bodies Exhibit and other groups held a press conference calling for an investigation and request that DNA tests be conducted on the bodies on display. Plastination is the process of skinning human bodies and injecting liquid silicone into the flesh to preserve it. 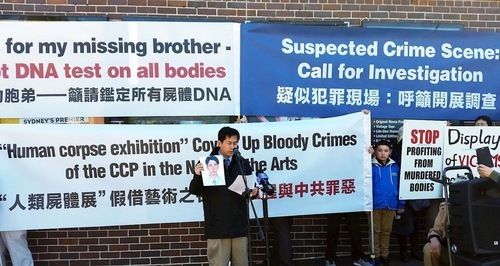 Dr. Huang Wanqing, a Chinese-American from New York City, was at the press conference to plead with Australian authorities to investigate the origins of the bodies, as he believed some remains may be of his missing brother from China, Huang Xiong. Dr. Huang’s brother, Huang Xiong, had been thrown into a labor camp by CCP (Chinese Communist Party) authorities for appealing for Falun Gong in July 1999, when the CCP launched its nationwide persecution. Dr. Huang Wanqing last heard from his brother on April 19, 2003, when his brother was either imprisoned in a labor camp or on the run from the authorities. Dr. Huang Wanqing holds a picture of his missing brother. After reading Dr. Huang Wanqing’s story, Ms. Qu Xiaojie from the U.S. was encouraged to voice her plea to look for her missing brother in the exhibition. Her brother, Mr. Qu Shanming, was a Falun Gong practitioner and former engineer at the China Academy of Launch Vehicle Technology. He was fired from his position in December 1999 because he practiced Falun Gong, and has been missing from Beijing since November 2003. His wife and daughter haven’t been able to find him since. Even though Xiaojie and her parents are living in the U.S., they haven’t dared to investigate out in the open for fear of retaliation by the CCP. Mr. David Matas, a renowned Canadian human rights attorney and co-founder of the International Coalition to End Transplant Abuse in China (ETAC), came from Canada to give a speech at the press conference in Sydney. Matas co-authored the book Bloody Harvest/The Slaughter: An Update with former Canadian Secretary of State for Asia Pacific David Kilgour and U.S. investigative journalist Ethan Gutmann. The 600-plus page report was released on June 22, 2016. He said there was compelling evidence that practitioners of Falun Gong are killed for both plastination and organ sourcing, and the exhibition of corpses was yet another form of proof of organ trafficking. Similar exhibits of plastinated human bodies have been barred in other cities, David Matas said at the press conference. Matas explained that body exhibits sourced from China have been banned by local jurisdictions in France, Israel, and Hawaii and Seattle in the U.S. The Czech Republic also passed legislation to ensure that such exhibits were not legal without donor consent. “In Australia, either these exhibits are legal or illegal. If they’re illegal, obviously the law should be enforced. If they are legal, there’s a gap in the law,” he said at the press conference. Matas added that in the eyes of the law, “It doesn’t really fall to us to establish that the sourcing of these bodies is improper. Rather, it falls to the exhibitors to show that the sourcing of the bodies is proper. But they don’t do that and that’s a problem.” He mentioned that the plastinated bodies have provided an immediate, widely-open and visible presentation of abuses of the victims. Nobel Peace Prize nominee and international human rights lawyer David Matas at a press conference in Sydney. Soon after the exhibition opened, there was a strong backlash from the media, various organisations, and human rights groups. Their common concern was that the bodies didn’t come from voluntary donors and that they could be persecuted Falun Gong practitioners. They called for a government investigation and a shutdown of the exhibition. The Sun published a report titled “GRUESOME CLAIMS Fears cadavers used in ‘Real Bodies: The Exhibition’ belonged to Chinese political prisoners who were tortured and murdered” on April 9. 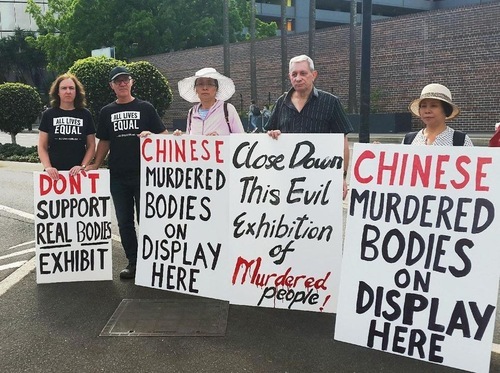 The Daily Mail reported “Exhibition is accused of using the corpses of executed Chinese political prisoners in its shocking ‘Real Bodies’ display” on April 11. The Guardian published “Call to shut down Real Bodies exhibition over fears it uses executed prisoners” on April 24. An article entitled “Calls for Government to Ban ‘Crass’ Real Bodies Exhibit” on The Sydney Morning Herald reported that “Twelve human rights experts have signed an open letter to Prime Minister Malcolm Turnbull and NSW health minister Brad Hazzard expressing their concerns over how the exhibits were sourced. The Australian Lawyers for Human Rights (ALHR), the NSW Bar Association, alongside other medical professionals, academics, and civil organisations, sent an open letter to NSW Premier Gladys Berejiklian calling for an immediate investigation into the ‘Real Bodies’ exhibition. According to legal and medical experts, “…credible evidence suggests that the exhibits may be the bodies and organs of executed prisoners of conscience including Falun Gong practitioners and Uyghurs, of whom there are currently over a million detained in China,” the letter said, citing the update of two meticulous independent investigations into the allegations of forced organ harvesting of prisoners of conscience in China. The exhibition was protested by concerned Australians Mr. and Mrs. Grace, who are Christians. When they found out about this exhibition online, they immediately printed their own fliers calling for its shutdown. They came to Sydney from Adelaide on the day the exhibit opened. Mr. Grace held his protest board outside the exhibition hall every day he was off from work. The couple also distributed fliers in nearby residential areas. Mr. Grace said the exhibition of corpses was an insult to humanity. He talked to many people who had visited the exhibition. Some of them couldn’t stop crying when they came out. They said they didn’t know the exhibition was like this. Mr. Grace said the murder would continue if they didn’t stop the exhibition or pay attention to the killing of Falun Gong practitioners in China. He would like to see the exhibition closed down and planned to continue following what’s happening in China. 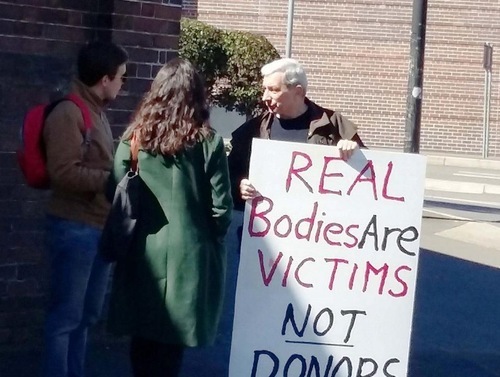 Mr. and Mrs. Grace (second and first from left) hold their own protest boards against the ‘Real Bodies’ exhibition. Falun Gong practitioner Geoff talks to a passerby about the persecution of Falun Gong. 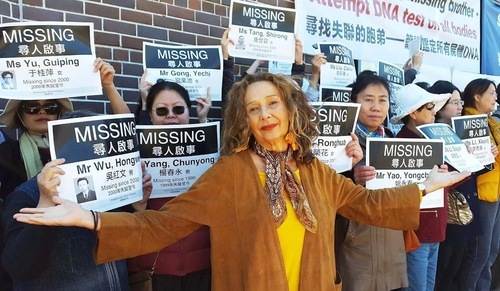 Ms. Josephine Wolansky, a supporter of human rights, told Falun Gong practitioners that she had been paying attention to the situation. She thought the exhibition was disgusting and it was completely wrong to display corpses. She knew the Chinese regime has arrested innocent Falun Gong practitioners and put them in re-education through labor camps. She said the exhibition made more facts of the persecution surface. She planned to get online to sign a Falun Gong petition. 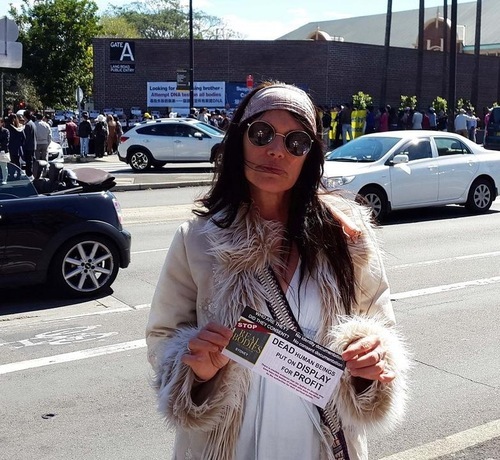 Human rights supporter Ms. Josephine Wolansky stands with exhibition protesters. Ms. Sapphire Chalmers, a local nurse, said she was shocked to know that dead human bodies were displayed at the exhibition. She knew that the way these people had died was already agonizing. Even worse, their bodies were utilized to make a profit. She thought whoever made this exhibition are no different from criminals. Ms. Chalmers planned to sign the online petition against this exhibition and spread the word to her friends. Ms. Sapphire Chalmers was shocked to learn the exhibition displays dead bodies.